Shaun Pollock, South Africa’s leading Test and ODI wicket taker, announced his retirement from international cricket on Friday. The recently completed Test match against the West Indies was his final Test and the forth coming ODI series will be his last ODI’s. Pollock surprised his team mates during the warm up for day 2 of the series deciding third Test against the West Indies by revealing to them his decision to retire. Although he was South Africa’s opening bowler for the last 12 years he had recently found himself out of the Test team as the selectors decided to take the attack in a different direction, focusing on bowlers with pace and aggression, rather then Polly’s immaculate line and length. Indeed since being named man of the series in Test series against India and Pakistan in December 2006 and January 2007 Polly has not featured in a single Test match until this last one. This lack of playing time may have had a significant say in Polly’s decision to pack it in, but it has still come as a surprise that he has retired from all international cricket as he is still South Africa’s, and the worlds, best ODI bowler. Although, the person that he is, he would never admit it, perhaps the treatment by the selectors, saying he is still an important part of their plans yet never playing him, continuously carrying out the drinks, got to be to much for the star all rounder. He was first dropped during the tour of Pakistan, where the selectors and team management stated they no longer felt he was as capable on sub continental wickets but that he would be back for the home series against New Zealand and the West Indies. Yet he found himself once again not included for the first 4 Tests, the two against New Zealand, and the first two against the West Indies. With the next two series being in the Sub continent, against Bangladesh and India, and knowing the selectors view of his bowling on those wickets, perhaps he decided that whatever was said in public he stood little chance of playing in the later series against England and Australia if he wasn’t going to feature in the initial tours. Incidentally, whatever the selectors may say, Pollock has the best record by any South African in the Sub continent and one of the best records of any pace bowler in international cricket. 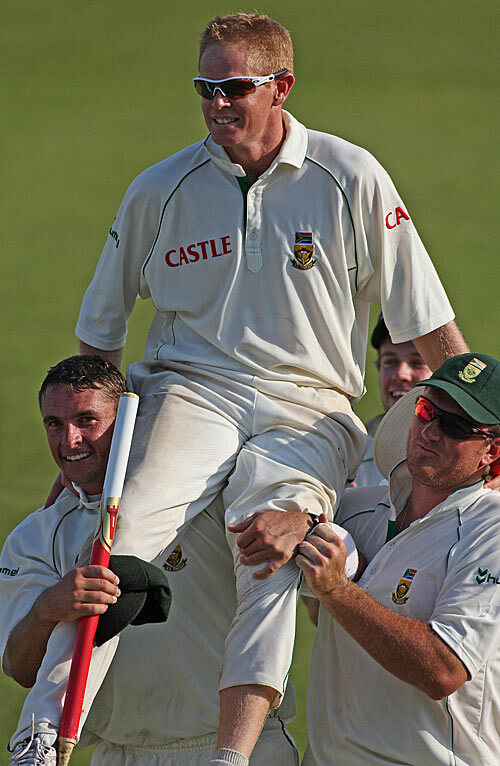 Shaun Pollock has had many highlights and milestones in his career, he is South Africa’s leading Test wicket taker, with421 wickets at 23,11 with best figures of 7/87 and match figures of 10/147, both against Australia, has 2 Test hundreds, against Sri Lanka and the West Indies, and is unlucky not to have a third as he scored one against India and a match that lost its Test status after India fielded a banned player, his batting average of 32,31 with 16 fifties and the 2 hundreds, coupled with his bowling, makes him one of the leading Test all rounders of all time, his superb ODI bowling figures of 387 wickets at 24,54 in 298 games, at an unbelievable economy rate of 3,69, maintained over such a long period, has him down as the worlds best ODI bowler, and a batting average of 26,33 with 14 fifties and 1 hundred (scored for an Africa team against Asia, his highest score for South Africa is 90) puts him up with the best ODI all rounders of all time. In truth, while his bowling has been his day job, so to say, he has never really been allowed to showcase his batting to its full potential. Often finding himself butting down at 8 or 9, he was never given the freedom and time to fully realize his batting talent, a fact that makes his batting record all the more impressive. With his pace slowing down as the years wore on Polly could easily have moulded himself as a batting all rounder, batting at number 5 or 6 in both forms of the game, and bowling first change. This would have prolonged his career and allowed his batting to flourish, something that the lower order never afforded him. While there is an element of being pushed in Polly’s decision, he will of course have been delighted that his final Test match was a series winning match, a match that he was able to contribute to, taking 4 wickets in the first innings (he did not get to bat in the match) and making his farewell on his home ground in Durban. Although he won’t be putting any pressure on himself, all South Africans, and many cricket lovers around the world, will be hoping that Polly has an exceptional ODI series and manages to pick up the 13 wickets in his last 5 matches that he would take him to 400 ODI wickets. And that he gets a chance to bat up the order! A group of young fast bowlers are waiting in the wings to take the mantle left by the legendary Shaun Pollock, a group including the all ready known Dale Steyn, the up and coming Morne Morkel, the revitalized Monde Zondeki, and the new comers Friedel de Wet, Lonwabo Tsotsobe and Sinethemba Mjekulu. 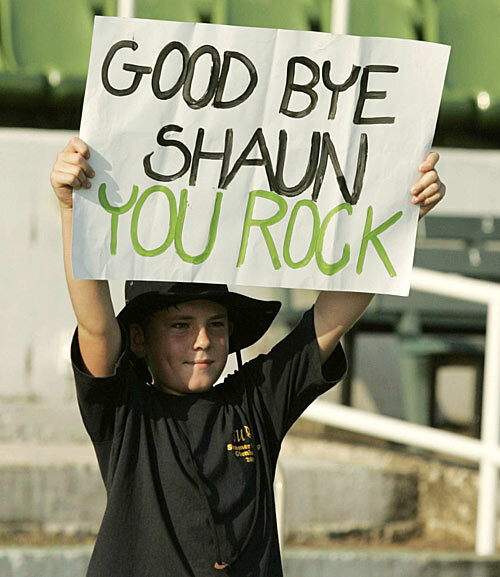 The potential and the promise is there for a successful transition, however there will never be another Shaun Pollock, and cricket is less without him. This entry was posted on Monday, January 14th, 2008 at 11:02 and is filed under Cricket, South Africa. You can follow any responses to this entry through the RSS 2.0 feed. You can leave a response, or trackback from your own site.